- Moderne kjøkken helt ny amerikansk type med; kjøleskap, induksjonstopp, stekeovn og mikrobølgeovn, oppvaskmaskin, TV 32 'og Nespresso kaffemaskin. Det er fullt utstyrt med servise, briller, briller, kopper, bestikk, panner, kjøkkenutstyr, etc. - Komfortabel stue med sofa, senterbord og klimaanlegg. - 2 terrasser: en foran havutsikt, markise, bord og stoler Menorca design. En bakre terrasse med slappe stol og salongbord. - Det er leid med sengetøy, håndklær og rengjøring inkludert. Gift 20 kapsler Nespresso. Rommet fullstendig renovert og moderne med dusj og badekar glass skjerm. På badet har et skap for håndklær. Badet har en vaskemaskin hvis ønsker å gjøre colada. Leiligheten er designet for maksimal komfort og alle de fasiliteter du trenger. Appartement donnant sur la rue en face les bars et restaurants, vraiment mal isolé. Nous entendions les voitures et le karaoke jusque minuit dans les chambres. A part ce point l’appartement était propre, bien équipé et conforme à la description. Excepté pour la piscine que nous pensions partagée pour la résidence. En fait les piscines proches sont celles des restaurants. Pour ceux qui souhaitent un endroit touristique et animé, l’appartement conviendra. Estimado Pierre, Lamentamos que el apartamento no se haya ajustado a sus necesidades, pero considerarlo ruidoso no es cierto. Solamente es un bar que algunos días tienen karaoke de 21:30 a 00:00 y es cierto que desde la terraza delantera en el exterior de la vivienda se escucha. Sin embargo no estoy de acuerdo cuando dice que el apartamento está mal aislado. El apartamento fué reformado completamente y la carpintería es de aluminio con cristal climalit. Si cierra las ventanas no se escucha nada en las habitaciones, pero si las deja abiertas claro que se escucha. El apartamento tiene aire acondicionado y no es necesario dejar las ventanas abiertas por la noche. En cuanto a la piscina si es de uso de los huéspedes de la urbanización y es de la comunidad, el restaurante da servicio a la piscina y lo que cobra es sus servicios de tumbona o sombrilla si los huespedes quieren usarlos. Entendemos que igual buscaba otro tipo de destino, pero no puede decir que el apartamento es ruidoso porque hemos tomado las medidas necesarias para asegurar que en las habitaciones no haya ruido. Unsere Bewertung bezieht sich auf einen 14 tägigen Aufenthalt im Juni/Juli 2018. Die Wohnung war für uns zu dritt (Ehepaar mit Kleinkind) sehr gut geeignet. Die Ausstattung ist wie beschrieben und es fehlte uns an nichts. Besonders gut hat uns gefallen, dass die Einrichtung noch recht neu ist und deutlich über dem sonstigen spanischen Standard Vor-Ort. Das Bad war sauber und frei von Schimmel. Die Klimaanlage (es sind zwei, Schlafzimmer + Wohnküche) haben Ihren Dienst gut erledigt. Die Fernseher sind neu, wurden von uns jedoch kaum genutzt. Die Programme, welche wir gesehen haben waren alle spanisch. Das hat uns jedoch nicht gestört. Die Küche ist gut ausgestattet, wir hätten jedoch eine normale Kaffeemaschine aufgrund der Müllvermeidung bevorzugt, aber das ist Ansichtssache. Der Balkon nach vorne heraus ist ausreichend groß und kindersicher. Die Aussicht auf den gegenüberliegenden Irish Pub und die gut besuchten Restaurants bieten am Abend eine gewisse Unterhaltung, lediglich die zweimal wöchentlichen Karaoke-Veranstaltungen sind etwas lauter, aber nur bis 0 Uhr. Unser Kind hat sich davon zum Glück nicht vom Schlafen abhalten lassen. Mit Auto sollte man zum Einkaufen nach Alaior fahren, die Supermärkte in Son Bou sind überdurchschnittlich teuer. Wir können das Apartment ohne Einschränkungen weiterempfehlen und werden sicherlich wiederkommen. The apartment was exactly as described, and was comfortable, clean and tidy. The kitchen was well-equipped and had everything we needed. 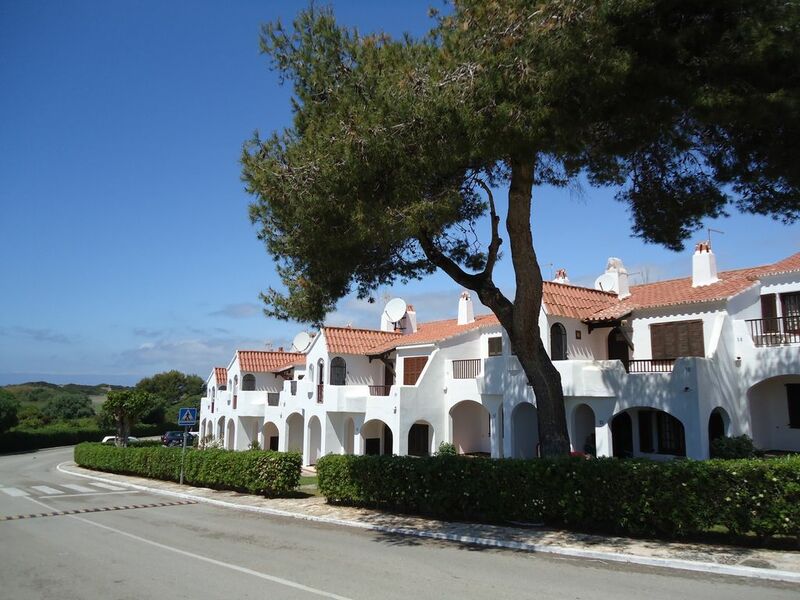 The location was really great and close to Son Bou beach (5 minutes walk), pools, shops and restaurants. It was really easy to get to the main roads and to explore other beaches and resorts on the island by car, as well as Mahon and Cuitadella. Parking was not a problem (we managed to park right outside our apartment). The only negatives about the apartment were that there was only one mirror (which was in the bathroom) and no air con in the second bedroom. In the complex there was a choice of pools with bar /restaurant and games room facilities and a waterslide. Unfortunately, the tennis court was not open during our stay, as it seemed to be awaiting some pre-season maintenance, which was still outstanding. Overall it was a great apartment and location for a family of four, including two teenage boys and we had a lovely week during May half-term. Thanks to the owners for their friendly service: easy to book, quick responses to queries, no hassle - would recommend the apartment. Ideal for a little family. We were here in May and it was perfect; it may happen to be a bit noisy in summer though, as there are restaurants and an Irish pub across the street. A tiny detail: the email we received from the landlord stated there would be soap, shampoo, dishwaher tablets and a couple of other things, which were actually not provided and the rental agency did not receive any instruction in that way. Dear Laurent, we liked having you in our accommodation and see how you enjoyed your stay. We regret that the agency has not left you shampoo and soap, we will clarify with them so that the next tenants have these cleaning products. As for your perception that in summer the apartment could be noisy, it is wrong. The noise that is in summer is the same that you have had in May, that is to say there is no noise, you just have to read the comments of the tenants who stayed in summer that certify that there are no noises. Although there are some restaurants nearby, the apartment is on the back of them and you can not hear anything. The only noise you hear is the song of the birds at dawn. Leilighet på stranden er bou, fin sand og turkist vann, som er den største i Menorca, med ca 4 km lang. Leiligheten ligger i et kompleks med tre bassenger, badeland, tennisbaner, kafeer, barer, restauranter. Det er i området av direkte tilgang til stranden og motsatt shoppingområde med bowling, butikker, restauranter, supermarkeder, øl, puber, etc. Arealet av Son Bou gjør det enkelt å utforske øya som det er i sentrum-sør for det og er like langt til mange steder av interesse.